I wanted oh so badly to come up with a cute, witty little name for this post other than "DIY Placecard Holders!" because, let's face it, that sounds about as exciting as watching paint dry. Unless of course you really enjoy watching paint dry, in which case the above title probably knocked you clean out of your chair. I'm going to go ahead and acknowledge the elephant on the blog; the elephant being the fact that probably none of us are actually going to spend our precious time making little doo-dads to denote seating arrangements around the table at Thanksgiving. If you're like my family, your Thanksgiving dinner is probably served buffet style and peppered with football broadcasts blaring in the background. And we wouldn't have it any other way thankyoukindly. This looks simple enough, right? 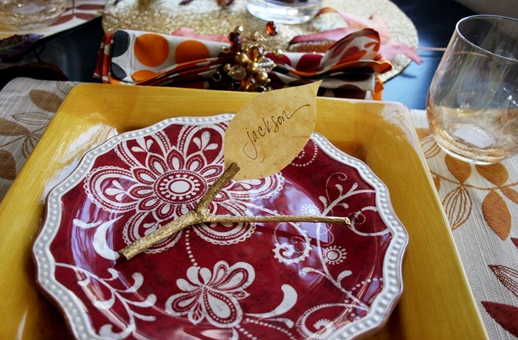 Go break off a couple of twigs from your nearest non-toxic tree and cut out a little paper leaf thing, writing the guest's name on the leaf portion in pretty writing. Adhere to the top of the branch and voila! You've got yourself one smashing placecard holder. Now THIS looks like an easy DIY. Like I could maybe actually do this myself. With the assistance of supplies from Michael's or HobLob. 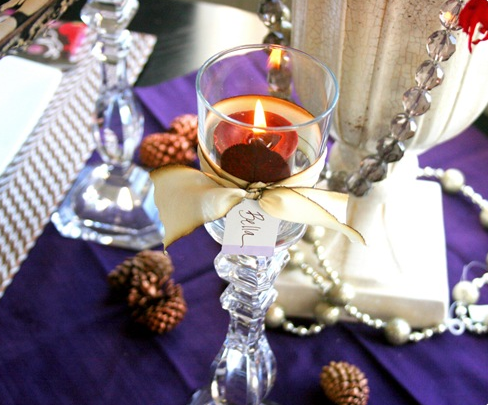 Buy some glass candle holders and pretty candles, tie a ribbon around the bottom of the globe portion of the candle holder and affix a nametag to the ribbon. Oh and light the candle so it looks fancy. I love this, but it would be a trainwreck if I tried to tell you how to do it. Instead, go here and read all about it from someone much more creative than I. Cute, huh? 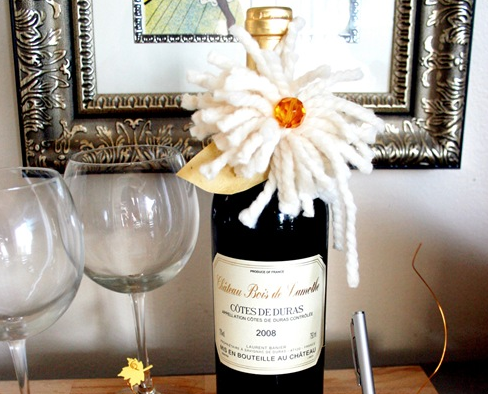 Refer to instructions for Wine Bottle Holder. And there you have it. 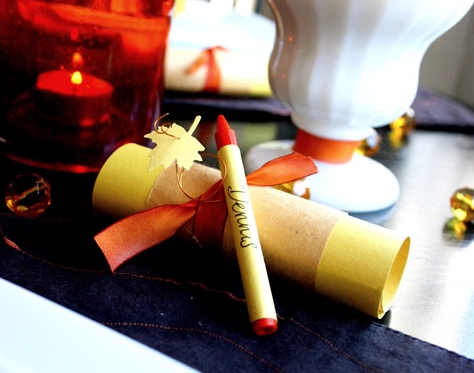 DIY Placecard Holders! that will knock their Jimmy Choos off. wow!!! How creative are those?! I LOVE the little apples!! These are so cute!! I love them all!! 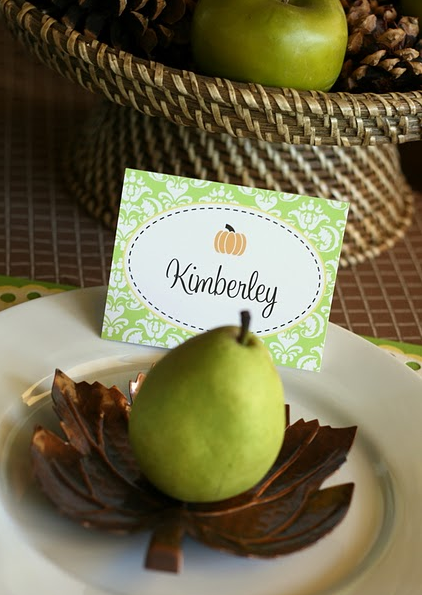 I think we should all try to make the effort to make place cards this year! It's such a simple thing, yet it makes things so classy. I love these! They would be fun for a wedding reception! My Thanksgiving is much like yours- buffet style, football, a little too much wine, and a nap! And NO ONE will be wearing Jimmy Choos.. We'll be lucky if people are wearing shoes, at all! Ok that first one from tom kat is my fav! SO Cute! you always crack me up....mainly because i say so many of the things you refer to without thinking twice about it. i totally say, "well isn't that just sweet?" when i really mean, "i'm so jealous that you have that much time and/or talent!" hahaha! 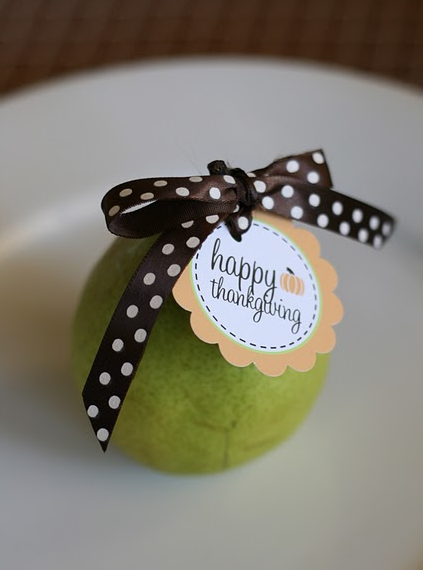 :) thanks for sharing these fab-o ideas! oh, you know i love DIY's :) these are super adorable!